Since the extra-tropical eddies carry a huge amount of moisture, heat, and momentum from their source regions to remote places, the long-term changes in their properties can lead to substantial changes in the Earth’s major climatic zones with huge socio-economic consequences. 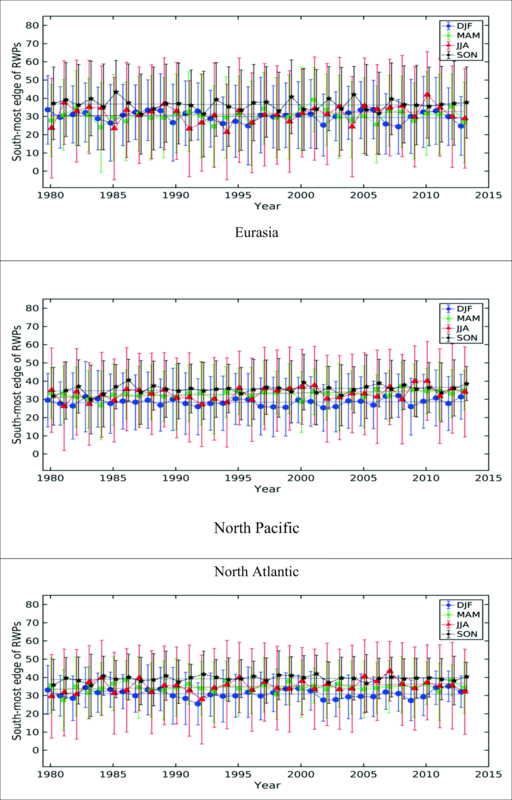 We present the long-term variability and trends in the spatial properties of the Rossby wave packets (RWPs) in the Northern Hemisphere in all seasons for the period of 1980–2013 using NCEP reanalysis for the three major storm track regions: Eurasian, North Pacific, and North Atlantic. A region of high-amplitude meandering flow in the upper troposphere that in the mid-latitudes travel in coherent wave train structures or wave packets is often referred to as a RWP. We found that the activity volume of the RWPs is largest during winter in all storm track basins. Our results suggest that the highest variability of the activity volume is in the North Atlantic region, while the minimum variability of this quantity is found during summer in the Eurasian basin. The largest relative frequency of significant wave packets is found in winter in the North Atlantic basin; however, the largest variability of this quantity is found in the North Pacific region during spring. The largest variability of the long-term daily maximum of WPA is found in the Eurasian region in winter and the minimum variability of this quantity is found in summer in the North Pacific region. The long-term northernmost point of the Rossby wave packets (which is an indicator of the meridional extent of the RWPs) shows that during autumn in the North Atlantic basin, the Rossby wave packets meander more than other seasons and regions. The minimum value of this quantity is found in the summer season in the Eurasian region. The largest variability of the northernmost edge of the RWPs is found in the autumn season in the Eurasian basin, while the minimum variability of this quantity is found in the autumn season in the North Atlantic region. We employ the non-parametric Mann-Kendall test to identify the statistically significant trends in the spatial properties of the Rossby wave packets. No significant trend is found for any diagnostic tools in any region and any season. 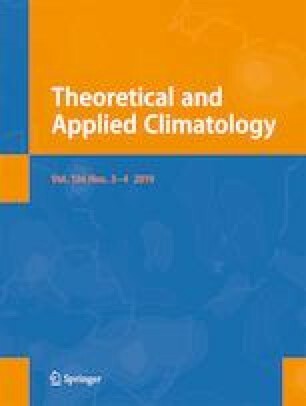 This suggests that the global mean temperature rise or other climatic changes (over the 34-year period of this study) do not have a detectable impact on the Rossby wave packets.